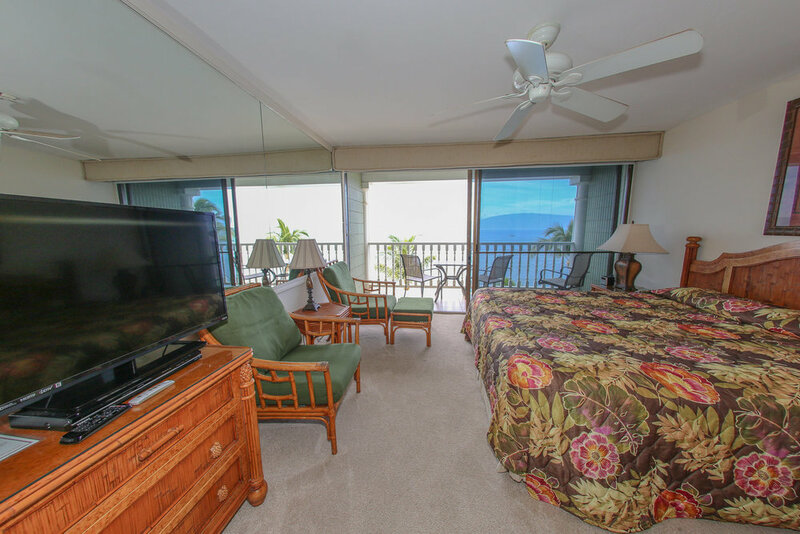 This oceanfront studio condo is on the 5th floor of the Lahaina Shores Beach Resort. Lahaina Shores offers a truly Hawaiian experience, with its plantation-era architecture and charming decor. Next door is 505 Front Street, a popular outdoor center filled with some of Maui's top restaurants, luaus, boutique shops, art galleries, convenience store, live entertainment, and more. If you are looking to experience all that the historic whaling village of Lahaina has to offer, this vacation rental is a great place for your home base on Maui. Minimum four-night stay. Call if you wish to book a shorter visit. We love staying at Unit 507 at Lahaina Shores and try to book our 10-day trip every year to Maui at this condo. We love the location of the facility and find everything we need at 507. The view is outstanding and offers us a full spectrum of the islands in every direction, the bay for watching whales and boats approaching and even leaving for early morning fishing ventures. 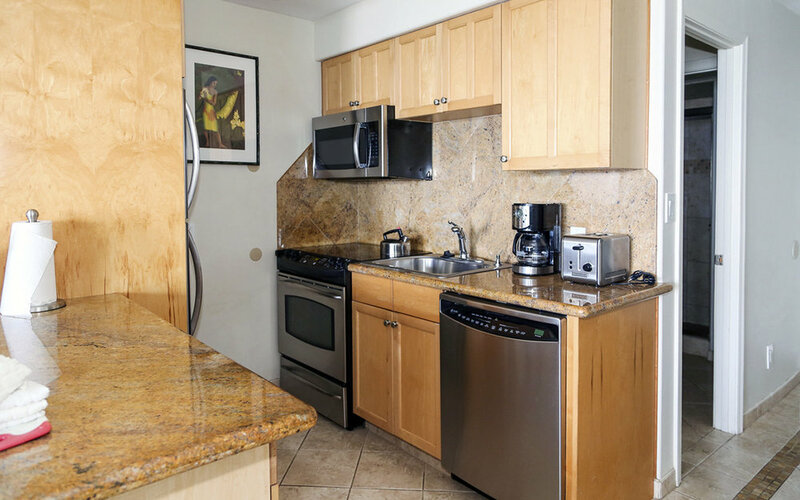 The unit is centrally located in the building and easy access to all of the amenities. Walking the beach in the morning is especially enjoyable. We also love the the walk to the marina and all the shops and restaurants on Front Street are minutes away. We drive as seldom as possible, leaving the car in covered parking below, and walk whenever possible. Sitting under the Banyan tree next to the marina is always lovely, listening to music or the sound of the birds. Unit 507 provides a very comfortable stay for us, with very lovely surroundings, nicely furnished and quiet when we need to rest from our activities. Customer service from management is excellent and our needs are always addressed immediately and professionally. We highly recommend staying at Unit 507 and will continue visiting Maui at least once a year. We could stay anywhere on the Island, and choose this location and this unit. Thanks for all the great service and beauty. We stayed at Lahaina Shores. 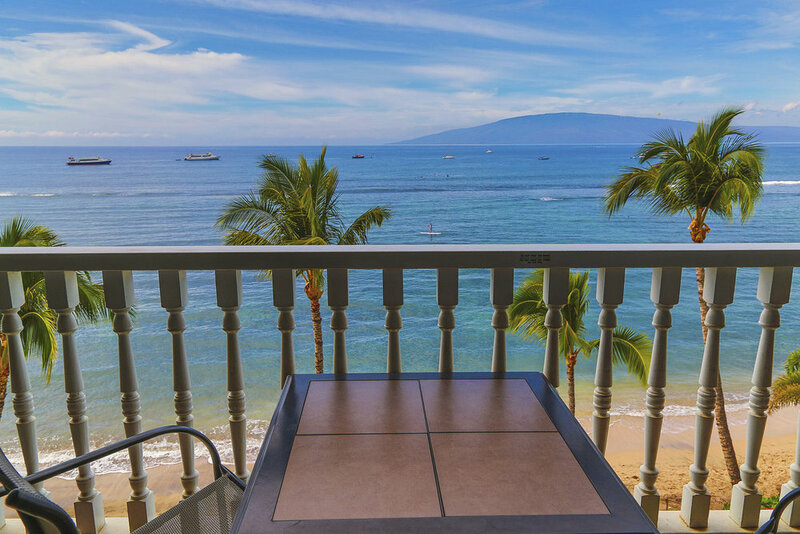 This is a great ocean-front condo on the south end of downtown Lahaina. Shops, restaurants and convenience stores are all within an easy walk. The condo was nicely furnished and well maintained. The facility has a nice sandy beach, an outdoor swimming pool and a large hot tub. Overall this place is a very nice condo, exactly what we expected. Its a studio, so it's not super big, but it was just two of us and we aimed at spending the majority of our time enjoying the lovely Maui weather so the room size didn't bother us at all. The room was clean and nice. It had everything we needed. It had all the kitchen stuff we required and they had some beach stuff for us which was nice. The place was well kept, and the staff was friendly. The location was good, just a short walk on the Main Street to all the shops and restaurants in Lahaina. I would stay here again and would recommend to friends or family. We love the location of this condo because it is on the 5th floor and gives a beautiful view of the beach and nearby Lanai. It far enough above and beyond the pool area as to be quieter in the evening and is in general a great condo as we have stayed there 3 years in a row and have booked it again for the 4th next October. We had the best time on our honeymoon here at Lahaina Beach Resort! We stayed at Lahaina Shores #507, place was beautiful, waterfront, awesome views, and a short stroll to everything on Front St. Only downside was getting there early, 11AM because of our early flight, and not being able to get into room until 3 PM, otherwise highly recommend this place. Wow...the view says it all from this condo. It was beautiful. Enjoyed having coffee in the morning and watching the sunset from the lanai every day. The blackout curtains were great and really worked. The unit is updated and well stocked. Although we choose to eat out for all of our meals, it was nice to be able to have drinks there and have coffee accessible in the mornings. The property itself is really pretty and well maintained. Excellent location and value. We spent 10 days in this unit and had a fantastic time. It has a great central location for access to tours, shopping, and local activities but being at the south end of Lahaina was quiet in the evenings when we quite often relaxed and admired the view of the beach, sunsets and cruise ships....Excellent parking facilities....Altogether a comfortable friendly vacation spot!